EDINBURGH, Scotland, 2018-Aug-23 — /Travel PR News/ — Food & Drink Fortnight (1-16 September 2018) offers the ideal opportunity for a Scottish foodie adventure, with a variety of events taking place the length and breadth of the country for all, celebrating local produce and offering unique food and drink experiences. Scotland is home to many food and drink favourites: from the west coast Seafood Trail and the famous Malt Whisky Trail; a variety of seasonal choices from Shetland lamb and fresh Perthshire strawberries; Scotland’s national dish, haggis; and a few unexpected surprises along the way, including over 50 gin distilleries, and seaweed, freshly caught on Scotland’s beaches. 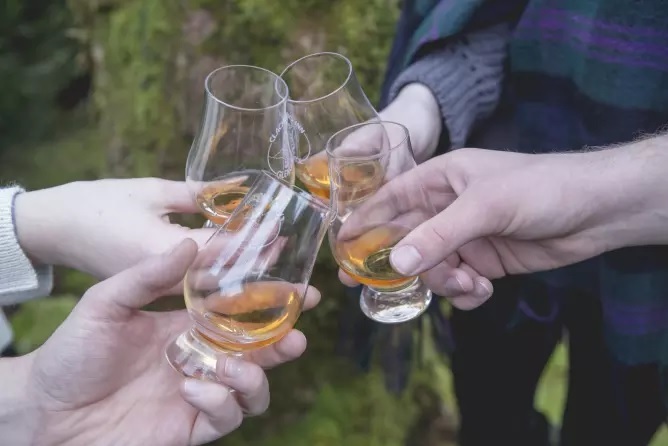 Added to this, the new Hebridean Whisky Trail – launched in August 2018 – and the fact the Bay Fish and Chips in Stonehaven, Aberdeenshire has been listed as the top UK food and drink experience by Lonely Planet*, there are plenty of foodie discoveries around every corner. The team behind the annual Spirit of Speyside Whisky Festival brings another fantastic event, Spirit of Speyside: Distilled. The world’s best whisky distillers are uniting under one roof on their own doorstep. What’s more, Speyside’s whisky distillers will be in good company as award-winning brewers, gin crafters, food producers and others, will be joining them. A weekend of food, drink, fun and entertainment, Loch Lomond Food & Drink Festival returns to the banks of the shores with another delicious selection of quality food and drink. There will be something for everyone including lots of live music, family entertainment and cooking demonstrations. A three-day celebration of Stranraer’s unique coastal heritage, its culture, its people and its delicious local seafood. Events include a family fun night, with delicious local food and drink prepared by local chefs; seafood street food with live music; and a silent disco for children; all finished off with a spectacular fireworks display lighting up the sky over Loch Ryan. Voted the best food and drink experience in the UK, by Lonely Planet*, the multi award-winning Bay Fish and Chips is located on the Stonehaven seafront in Aberdeenshire. With a focus on local produce, Lonely Planet has commented, “Considering the setting, the sustainability and the beautifully cooked fish, is [the Bay] the best fish and chip shop in the world? The constant queue suggests so”**. The island landscapes of Skye, Raasay and Harris are the backdrop to Scotland’s newest whisky adventure, the Hebridean Whisky Trail. The new trail, launched in August 2018, has been designed with intrepid whisky wanderers in mind, connecting four neighbouring distilleries – Isle of Raasay Distillery, Torabhaig Distillery, Talisker Distillery and the Isle of Harris Distillery – through one spectacular 115-mile route. The new trail can be enjoyed by road or by sea with three Calmac ferry crossings linking the destinations, as well as yacht berthing facilities near to each distillery. Set amidst some of Scotland’s most scenic sea and mountain locations, each distillery has its own distinctive character and atmosphere. Darnley’s Gin, located in Kingsbarns in Fife, has added a ‘Distil Your Own’ experience to their tour offering, inviting visitors to the distillery to create a bespoke bottle of gin. The experience involves an introduction to gin making before exploring the large range of botanicals available to include in their recipe, some of which are grown in our own cottage garden. The hands-on experience continues as they weigh the botanicals and begin distilling their one of a kind gin on their own mini still. While this is happening, guests will enjoy a tour of Darnley’s main distillery whilst sipping on a refreshing Darnley’s G&T and led through a tasting of the Darnley’s Gin range. Scotland’s Seafood Trail, on the picturesque west coast, takes visitors through the most spectacular coastal scenery with the opportunity to taste seafood and shellfish from a wide variety of waterfront establishments. From the freshest of crab rolls served with a squeeze of lemon and some home-made mayonnaise, to Michelin-rated menus that feature a wide range of dishes, this is a truly memorable way to enjoy what Scotland has to offer. Scotland’s Malt Whisky Trail is the only trail of its kind in the world. Set in the heart of stunning Speyside, this trail takes in seven world-famous working distilleries, one historic distillery and the fascinating Speyside Cooperage. Speyside is famous for its wonderful whisky and is often called ‘Malt Whisky Country’. It’s home to more than half of Scotland’s malt whisky distilleries, making it the ideal place to discover more about this ancient art. Scotland’s national dish, haggis, is best served with neeps (turnips) and tatties (potatoes) and is traditionally served on Burns Night (25 January) every year. There remain some misconceptions about what it is made of and how it is made: the dish is a type of savoury pudding that combines meat with oatmeal, onions, salt and spices. And for any weary travellers in need of a filling meal, take it from millions of haggis fans – it’s delicious and is also available as a vegetarian option. This entry was posted in Festivals and Events, Food & Drinks, Tourism, Travel, Travelers and tagged Food & Drink, Fortnight, Scottish foodie, VisitScotland. Bookmark the permalink.